Manufactured by Belmont for United Motors Service under the Delco brand, the R-1135 originally sold for $18.95, two dollars more expensive than its R-1134 walnut bakelite cousin. 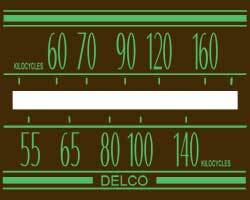 This nice Delco R-1135 was purchased off ebay for a steal of 20 bucks because it was missing the dial scale and had a horrible paint job. I stripped the cabinet and repainted it back to the original ivory color. The dial scale was created in Photoshop after tracking down pictures of other examples and is shown below. 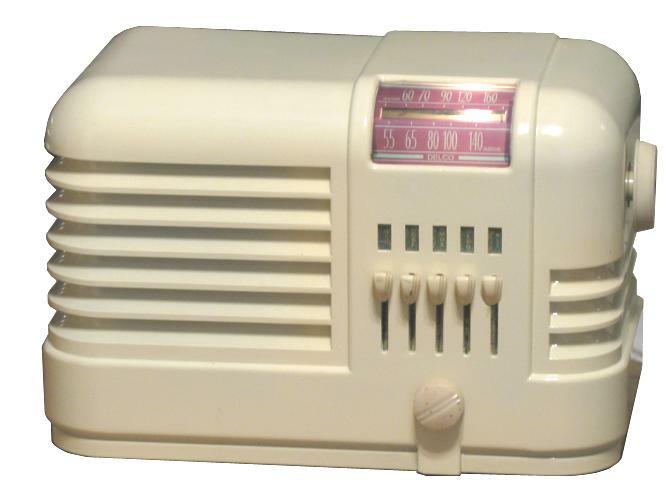 The dial was printed out on a transparency using a color laser printer and painted white from the behind so the colors have contrast and for opacity.